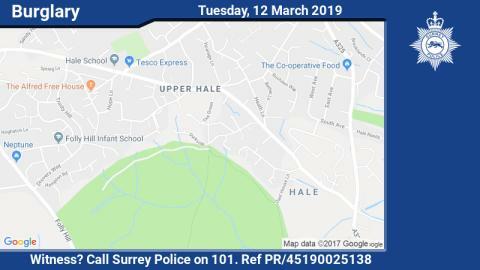 We are appealing for witnesses after three masked men stole a large quantity of cash after breaking into a property in Farnham on Saturday evening (9 March). The occupants had returned home to the address in Parkside, Hale, around 6.20pm and disturbed the suspects in a car on their driveway as they were trying to make off. The suspects drove their vehicle into the occupants’ car before one of the suspects got out with a weapon, which he used to damage a side window of the victims’ car. The suspects then made off in a silver saloon car. Officers are investigating whether this break-in is linked to another burglary at an address in Parkside on the same evening where two watches were stolen. Investigating officer Detective Constable Mike Taylor said: “Thankfully the occupants whose car was driven into were unharmed, although they are obviously extremely distressed as a result of what happened.